BOSTON – Rajon Rondo hit a 20-foot jumper as time expired to lift the Los Angeles Lakers over the Boston Celtics, 129-128 on Thursday night. 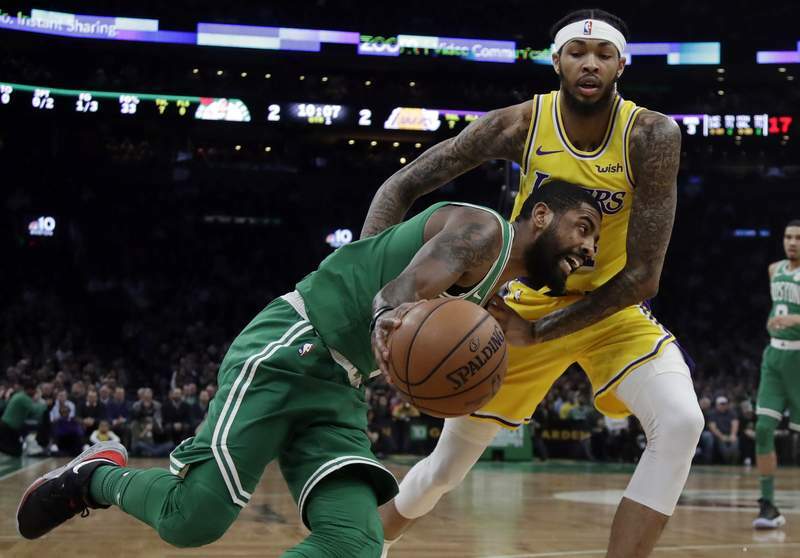 It ended a wild, speculation-filled day in which the NBA's trade deadline expired with one of the players potentially on the wish list of both the Lakers and Celtics staying with his current team. The Lakers weren't completely quiet Thursday, trading Michael Beasley and Ivica Zubac to the Clippers for Mike Muscala. James and Irving traded shots down the stretch. In one exchange James' 3-pointer cut Boston's lead to 114-113. Irving then calmly responded with his own step-back 27-footer. The Celtics stood mostly pat at the trade deadline, except for trading Jabari Bird to the Atlanta Hawks. The move opens a roster spot for the Celtics and allowed them part ways with a player who hasn't played this season after charged with beating up his girlfriend last September. "Those teams were already really good. And the assumption would only be that they'd only benefit from those moves," Celtics coach Brad Stevens said. "It will be quite a challenge. As we knew it would be."